Posted by Jeff Hammett in bars and restaurants, beer stores, bottlecraft, breweries, green flash brewing co., pacific beach ale house, rock bottom la jolla, tiger!tiger! San Diego Beer Week 2011 is underway and the first weekend is now coming to a close. I decided this year I needed to take things a little more slowly than I did last year (if I remember right I didn’t drink beer for about two weeks after SDBW 2010) so I missed a few things this first weekend (and surely will miss more events for the rest of SDBW) but here’s what I drank. I started SDBW a night early at Tiger!Tiger! for their Golden Road showcase Thursday night. Golden Road is a new brewery in LA that opened just a couple of weeks ago. From what I hear they have no plans to start distributing outside of LA at this time, but decided to bring a few kegs down to Tiger!Tiger! for San Diego Beer Week. Co-founder Meg Gill (formerly of Speakeasy Ales and Lagers and Oskar Blues) and brewmaster Jon Carpenter (formerly of Dogfish Head) were on hand but I didn’t get a chance to speak with them. They currently have three beers and brought all of them down. Hefeweizen is a nice flavorful hefeweizen that’s easy to drink and won’t knock you down after a couple of pints at 4.6% ABV. It’s a beer I wouldn’t hesitate to order again (especially on a hot day) but I’m not sure that it stands out when compared to other craft hefeweizen’s. Point the Way IPA stands out for being full of flavor and on the lower side of the IPA ABV spectrum at 5.2%. The aroma was fantastic and while the flavor didn’t quite stand up to what I expected from the smell it was still good. Burning Bush is a smoked IPA that was pretty interesting. The smoke was there but not overpowering. At 8% ABV it’s stronger than Point the Way IPA and much more malty. The hops are there, but don’t jump out nearly as much with the smoke and maltiness. And while it’s a very different beer, it reminded me a bit of Rumble (oak aged IPA) from Great Divide. The smoke really is very subtle, it’s there if you look for it but doesn’t overpower the rest of the beer. Friday night I didn’t go out, opting to spend the night with the family sharing a couple bombers with my brother. We had the recent release of Ballast Point’s Victory at Sea along with Stone Brewing Co.’s 11.11.11 Vertical Epic. This might be my favorite batch of Victory at Sea to date. I don’t have any tasting notes from previous batches, but the coffee seems much more prominent in this batch. The vanilla is still there but it has a nice roastiness to it. 11.11.11 Vertical Epic is an amber colored Belgian-style ale brewed with chiles and cinnamon. I felt like there was a bit too much going on with it. The chile flavor is delicious, it’s right up front giving plenty of flavor without a ton of heat. It’s one of the most flavorful and not overwhelming chile beer’s I’ve had. After that though it seems to drop off a bit. I get some toffee like sweetness from the malt but I didn’t taste much from the Belgian yeast. The cinnamon came out at the end and I really didn’t like it. It wasn’t overwhelming but definitely there and was the last impression with each sip. Saturday was the San Diego Brewer’s Guild Festival at Liberty Station. There’s a lot to be said about the festival itself, but I’ll leave that for another time. I had a number of beers, one or two I didn’t like at all, quite a few I thought were good and a couple I thought were great. Barrel Aged Tourmaline Trippel from Pacific Beach Ale House really stood out. I think they get passed over quite a bit because of their location but brewer Erik Jensen know’s what he’s doing and makes good beer. This was inoculated with Brett and aged in a previously used bourbon barrel for a few months. Mary Jane IPA from Rock Bottom La Jolla also stood out. I didn’t get the ABV but I’d guess it’s in the 6-7% range. It was easy to drink with nice pine and tropical fruit flavors. Green Flash’s 9th Anniversary IIIPA (not sure of the official name, one handwritten sign said Green Bullet but I don’t know if that’s the actual name) was also very good. It was big and hoppy with plenty of hop flavor along with the bitterness. Brewer Chuck Silva told me they used hop extracts in addition to the regular hop pellets. If you get a chance to try this I’d highly recommend it as it might not be around too long. Later that night I went to Assembly, the vegan beer dinner I helped plan with LoveLikeBeer and Sea Rocket Bistro. The dinner went well with great beer from Jolly Pumpkin and delicious food from Chef Chad White. Fuego del Otono, La Parcela, Bam Biere, and Bam Noire were all served. Sunday I stopped into Bottlecraft for the Bison Brewing event. They had Bison Organic Chocolate Stout and Barrel-aged Bison Chocolate Stout being served side by side. The barrel aged version was aged in Four Roses Bourbon barrels (and I was told but didn’t confirm it with the brewer) that they were second use barrels. It’s been a while since I’ve had the regular Chocolate Stout but I was reminded of how much I enjoy it. The barrel aged version didn’t quite live up to my expectations, it was good but I think I enjoyed the regular version more. Gone was the subtle chocolate sweetness, replaced with a mellow bourbon flavor. At 6.1% ABV it’s lower in alcohol than many beers that are aged in bourbon barrels so it didn’t have the same mouthfeel that one might come to expect from barrel aged beers. Still good, but I’m plenty happy with the regular Chocolate Stout. There’s still seven days left of San Diego Beer Week. If you’re looking for some things to do for the remainder check out these guides for my take on some of the best beer events and the best beer and food events. 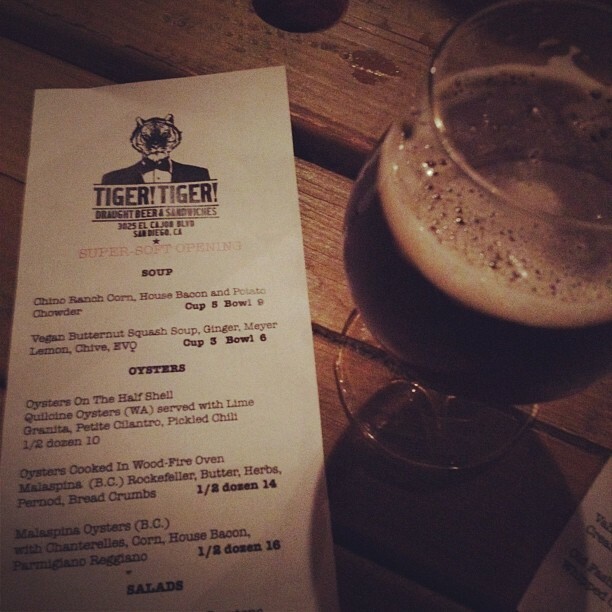 Posted by Jeff Hammett in bars and restaurants, blind lady ale house, tiger!tiger! Tiger!Tiger! the new bar/restaurant from the owner’s of Blind Lady Ale House opened it’s doors for the first time last week. They’re calling it an ultra soft opening for the time being but when I stopped by things seemed to be running smooth enough. I didn’t get a chance to eat while there, but heard from friends that the food is great. The beer selection had many of the usual suspects often found at BLAH. Prices seemed similar.The space itself is pretty nice, with a long bar, a handful of picnic tables for seating and a couple of tables outside on the front patio. For now Tiger!Tiger! is only a bar and restaurant, but co-owner Lee Chase told me recently that he’d like to use Tiger!Tiger! as a sort of pilot brewery for the soon to be expanded brewhouse at BLAH. Located at 3025 El Cajon Blvd (just east of 30th Street), Tiger!Tiger! is currently open 5pm-Midnight Tuesday through Sunday. According to their website they’ll be adding lunch hours Friday, Saturday and Sunday soon. Here are a few photos they posted from the first weekend. 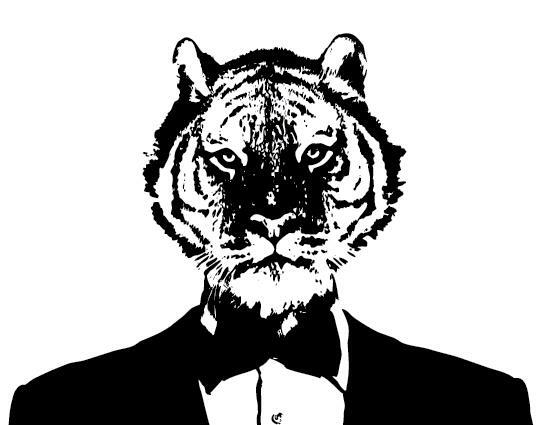 By now you may have heard that the owners of Blind Lady Ale House are opening up a new bar and restaurant, called Tiger!Tiger! at 3025 El Cajon Blvd, near the corner of 30th St.
BLAH Chef Aaron LaMonica will be in the kitchen and despite the wood fired oven in the dining room pizza will not be on the menu. And just like BLAH there will of course be plenty of beer. They’ve stressed that the intention isn’t to do another Blind Lady Ale House, so expect something a bit different. As for when Tiger!Tiger! will open there seems to be no firm date in place, but it will be a stop on this Saturday’s Bike the Boulevard, a bike ride along El Cajon Boulevard starting at Til Two and ending at Live Wire with stops at Soda Bar, Tiger!Tiger! and the Lafayette Hotel along the way. I’m unsure of whether this is a preview or a soft opening, I’ll post more details about when to expect Tiger!Tiger! to be up and running when I hear about them. For now, if you want to check it out, be sure to be at Til Two Saturday at noon with your bicycle. Check out more details on Facebook. UPDATE: Just noticed in their latest newsletter that MIHO Gastrotruck will be parked outside of Tiger!Tiger! from 3-6pm Saturday. UPDATE 2: Co-owner Jeff Motch reiterated on Facebook that Tiger!Tiger! is open this Saturday for Bike the Boulevard participants only and that they’ll be closing the doors when the ride moves on to the next stop (around 3:50, fifty minutes after they arrive). So be sure to show up on your bike if you want to check out Tiger!Tiger! this Saturday!